A list of all the science fiction short stories (and novellas) that Cordwainer Smith wrote, with dates of original publication. Another list of all the stories, in the same order, but this time the entry for each story lists which books it was published in. (Anthologies with works of various authors are not included.) This list includes alternate titles as well. A list of all the books, with publication dates. And a list of what stories appear in each book. I'm sure this page will have many uses. One handy one would be for someone thinking of buying a used book online and wanting to know what stories are in it. I've removed all the illustrations from this page. With literally hundreds of hyperlinks, I wanted it to load as quickly as possible. See other pages in this section for cover art. As I edited this page for this revision of the website, I was once again astounded at the work that Mike Bennett put into this list. Of course, there may be a few errors in a work of this magnitude -- including some I may have introduced in editing the html code -- but I expect you'll find it useful. Do browse through it -- it's not only a list; here and then Mike Bennett comments as well. The Adjutant was Central High School, Washington D. C. cadet corps's paper. Rewritten in 1961 for inclusion in You Will Never Be The Same. Page 64 has a facsimile of his letter of submission to Fantasy Book dated March 9, 1948. 1. Saturn, May 1957, pp 62-75, printed as "Mark XI"
1. Satellite, March 1959, pp 25-29, printed as "The Nancy Routine"
Alternate Titles: "The Goonhogo Itself On Venus"
Golden The Ship Was - Oh! Oh! Oh! Alternate Title: "The Lords Of The Instrumentality"
Alternate Titles: "The Robber, The Woman and The Moon"
"To Wake, to Kill, to Die"
Alternate Title: "People Never Live Forever"
Alternate Title: "The Big Lick"
Alternate Title: "She Got The Which of the What She Did"
Alternate Title: "Lady if a Man . .. ."
Illustrated by R. D. Francis. Alternate Title: "The Wise Old Horse On Pontippidon"
Alternate Title: "Archipelagoes of Stars"
Cover and Illustrated by Lloyd Birmingham. Alternate Title: "Those Good Old Friends of Mine"
The first half of Norstrilia, edited and added to for magazine publication. See also The Planet Buyer. The second half of Norstrilia, edited and added to for magazine publication. See also The Underpeople. Cover by Dember. Illustrated by Giunta. Alternate Titles: "The Dead Lady Panc Ashash"
"The Brown and Yellow Corridor"
Alternate Title: "In Praise Of Folly"
Alternate Titles: "The Sum Is Null"
"Put A Double On The Dark Remote"
Cover and Illustrated by Virgil Finlay. Completed by Genevieve Linebarger from the original 2 chapter fragment. Cover and Illustrated by Cecilia Cosentini. According to Alan Elms, this was originally written by PMAL and he considered his 1946 draft to be a completed story, circulating it to several magazines, all of whom rejected it. Genevieve revised that version in the late 1970's for Harlan Ellison's "Last Dangerous Visions" (which has yet to see the light of day). Presumably, this revision is the version printed in "The Rediscovery Of Man", printed by NESFA in 1993. J.J. Pierce, says that a revised edition was intended for You Will Never Be The Same titled either "My Love Is Lost In The Null Of Nought" or "She Lost Her Love In The Null Of Nought" but it wasn't completed. Expect more updates in this section as more data emerges over time. Romances From The Plunging Future"
1. No, No, Not Rogov! 6. Golden The Ship Was - Oh! Oh! Oh! "Assembled with the valuable assistance of Robert Silverberg." Reprint of the 1970 Berkeley edition. Selected by Lester del Rey for the Garland Library of Science Fiction. The first half of Norstrilia, edited and adapted from The Boy Who Bought Old Earthfor book publication. Coverby Peter Bramley (based upon earlier printing). Original Printing erroneously listed as October 1975. Coverby Eric Ladd (based upon next printing). Does not include Timeline and Introduction. The second half of Norstrilia, edited and adapted from The Store Of Heart's Desirefor book publication. Norstrilia has a complex history of publication, ignoring the complex history of writing it also underwent. Presumably finished sometime in 1963, it was broken into two pieces, the first half having some additional material written for magazine publication as The Boy Who Bought Old Earthin April 1964. This process also occured to the second half which was published in the magazines as The Store Of Heart's Desirein May 1964. In October 1964, "The Boy Who Bought Old Earth" was sculpted into the novel The Planet Buyerand the same process occured to "The Store Of Heart's Desire", resulting in the novel The Underpeople. In February 1975, the presumed original manuscript of "Norstrilia" was published as one. Was it the original manuscript? The NESFA Press version from 1994 is the definitive version. It bundles together "Norstrilia" along with all the text added or changed to the original manuscript from "The Boy Who Bought Old Earth", "The Store Of Heart's Desire", "The Planet Buyer" and "The Underpeople". Although it is stated in the NESFA Introduction that "Norstrilia", as first published, had been constructed from the two fragments, it seems unclear since the original printing never stated the source of the manuscript and the story flowed smoothly. "The Boy Who Bought The Planet Earth"
"Roderick Frederick Ronald Arnold William Macarthur McBan CLI"
"The Lover Who Loved And Lost C'Mell"
About the author by J. J. Pierce. About the author, although on Contents page, is missing. Edited and Acknowledgements by James A. Mann. Forward, although anonymous, probably by James A. Mann. 8. Golden The Ship Was - Oh! Oh! Oh! request of Judy-Lynn Del Rey. Retitled "The Rediscovery Of Man"
3. No, No, Not Rogov! 1. Introduction by John J. Pierce. 2. Editor's Introduction by James A. Mann. 17. Golden The Ship Was - Oh! Oh! Oh! 1. VGSF 04165 - See The Best Of Cordwainer Smith. 2. Gollancz 04352 - See The Best Of Cordwainer Smith. The Best Of Cordwainer Smith was issued as The Rediscovery Of Man in Great Britain. printing of The Best Of Cordwainer Smith. If you click through on the links I provide to Amazon and other vendors, and if you make a purchase, in most cases I receive compensation. NEW! 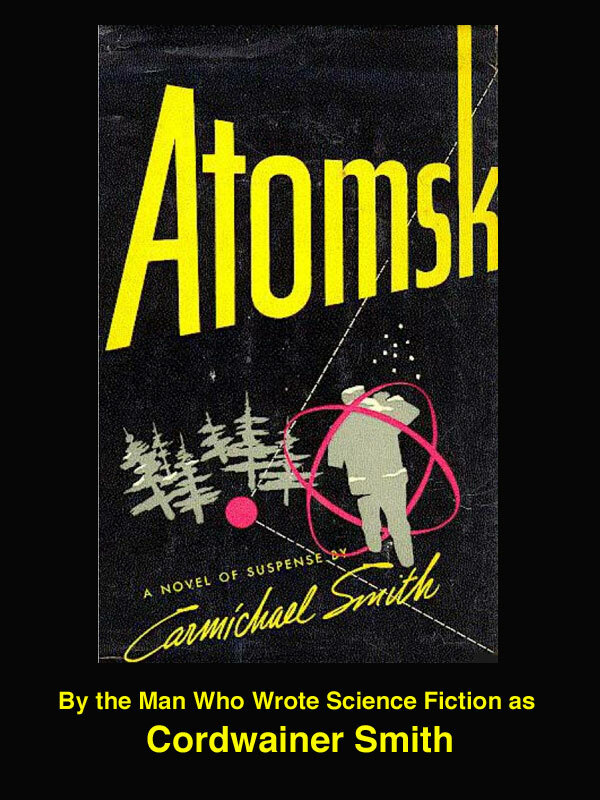 His spy thriller Atomsk, written as Carmichael Smith, is now on the Kindle! Click on the image to find out more at Amazon. Was Paul Linebarger Kirk Allen? 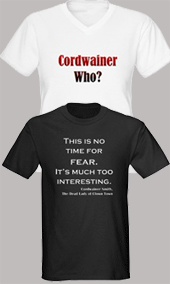 www.cordwainer-smith.com and www.cordwainersmith.com Copyright 2008-- Hartworks, Inc.